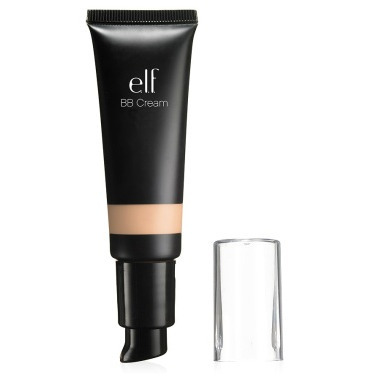 Prime, protect, moisturize, and perfect your skin with this multitasking e.l.f. BB Cream. Infused with key anti-aging ingredients like Vitamin E, Jojoba, Aloe, and Cucumber to hydrate and nourish the skin. The smoothing formula minimizes fine lines and provides a natural tint of colour for seamless coverage. How To Use: Apply a thin, even layer all over the skin with a brush, sponge, or fingertips and blend in. Wear alone or under foundation. I used to love this bb cream but now that I know oxybenzone is an endocrine disruptor I must cease using it. Great product, great price. Really have to blend it in well, other wise it's streaky. Really nice stuff - very light coverage, and while it appears too dark for my very fair skin before application, it adjusts really well. I use it sparingly, and with an applicator brush, and it makes my skin look great - even and smooth, without looking like I'm actually wearing any makeup. Great price too, given the cost of so many of the BB and CC creams out there. Makes my face look shiny and I donâ€™t love the smell. Good coverage for the price. Great product, blends well but is heavy on the skin if you put it on your entire face. Goes on really nicely, and blends easily, but I don't like the smell. It works well with my normal/dry skin but I don't like the smell at all. Seems extremely greasy on my skin, to the point that I worry about breakouts or having it just slip off my face if I get slightly sweaty or touch it by accident. It's great for dry winter skin, though, looks beautiful, and it smells like flowers. I do not like to wear a lot of make-up so I decided on a BB cream. This one is a little thicker than I would like so I mix it with a little bit of face cream and it goes on so easily. It adds just the right amount of color. The price is great. I love this stuff. It is one of the best BB's around. I love that this BB cream is a little thicker than most, I need full coverage, but prefer something lighter than foundation - this is PERFECT! This BB cream is excellent! The all-in-one is very handy for even coverage with SPF. A great (daily) staple if you don't always want to cake on sunscreen and foundation - and you only need so much as it spreads well! Also very useful if you take a day/weekend trip and need to pack light. I have sensitive skin and it's worked beautifully. Love it! I used Laura Mercier tinted moisturizer before, which is pricey. This one is amazing quality, very light coverage, blends nicely, doesn't leave "chalky" layer on the face. And it is very affordable! Awesome dupe for those expensive foundations. The price is right. It didn't irritate my skin. So I'll keep using it. The only thing is on here it says SPF20 but on mine there's no SPF to be found. Maybe I got sent the wrong one? Not a full coverage BB cream but it covers enough. I like it. ELF is really stepping up their game.. Wish there were drugstores in Ontario that sold their products so I could test everything out! The price was right and I was happy that this product had more coverage than most bb creams. Cheap and effective. Reduces discolouration (redness, under-eye circles, and age spots) to the extent that no concealer is necessary. Hydrates well. Would repurchase.